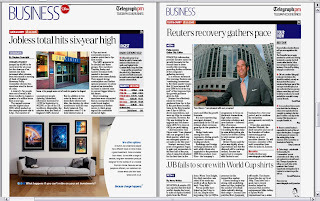 Zurich became one of the first advertisers to use Telegraph PM today. In a great example of online and online coming together, we negotiated for Zurich's newspaper copy to be adapted so that it could run in Telegraph PM, the electronic afternoon edition of the Telegraph. Colour half page ads that have been running in the newspaper have been resized so that they can be used for Telegraph PM. Additionally logos on the ads have also been enhanced so that readers can click on them and be taken directly to the Zurich website. The campaign will last for one month, will feature 2 different half pages each day (one in news, one in business) and creative will promote Zurich Car Insurance, Zurich Home Insurance and Zurich Business Insurance.